Aqua Kitchen and Bath Design Center located in Wayne NJ, has one goal – to provide you with high-quality, functional, beautiful, and long-lasting kitchen cabinets and countertops. We understand how important your projects are and always give our complete attention to meeting your needs. If you are thinking about building or remodeling your kitchen and need cabinets and countertops, then visit Aqua Kitchen and Bath Design Center. We will make your project smooth and pleasant to accomplish. We have successfully provided NJ homeowners, builders, contractors, designers, and other clients with exceptional residential and commercial products and unmatched customized customer service for over a decade. Here are some great reasons to buy your next kitchen cabinets and countertops from Aqua Kitchen and Bath Design Center. 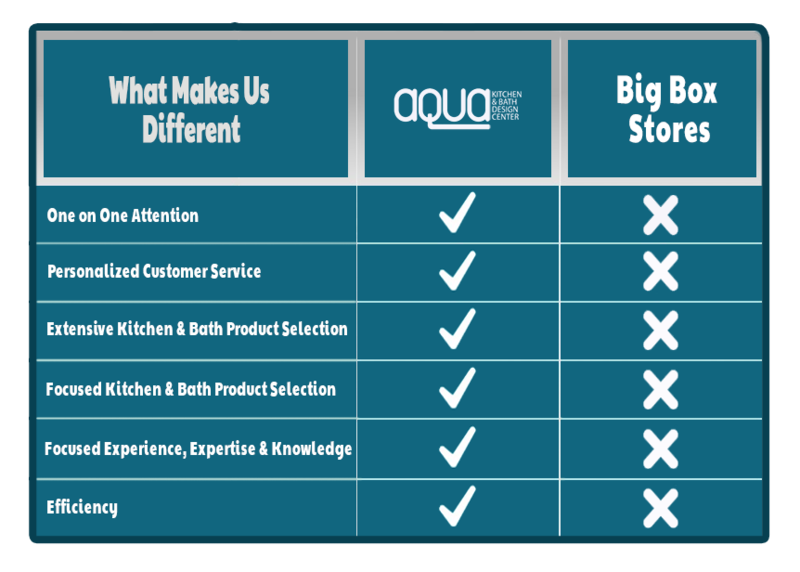 At Aqua Kitchen and Bath Design Center, every customer gets 100% of our attention regardless of the size of the job. We assign dedicated professionals who will take care of your project from start to finish. If you go to any big box office store, you will have to deal with whoever is on the floor that day. Go the next day, and you may have to deal with another customer service rep who won’t know any of the details you shared on your previous visit. They will never demonstrate the same dedication, passion, devotion, and commitment to your project that we do. We offer free 3D design capabilities that will show what your ideas and vision will look like in real space. Our personalized design expertise and knowledge is a huge benefit that can’t be matched by any big box store. We also provide in-house measurement and collect all details about your project and needs. If you take your business to a big box store, you won’t get this kind of service. We work in a much more efficient way than competitive big box home improvement stores in NJ which will help you complete your project on time. Conveniently located on Route 23 in Wayne, NJ our centralized operation with indoor and outdoor slab yards, allows us to maintain close communication with our kitchen cabinet manufacturers and suppliers, local professional cabinet installers, as well as our own in-house installers/templaters. A big box store will not be able to provide you with personalized and prompt customer service because of their size. At Aqua Kitchen and Bath Design Center, we have all the latest and greatest kitchen and bath designs and products. That’s because kitchen and bath product design is our specialty. With the widest range of beautiful product selections and hardware located at our Wayne facility, we are able to fulfill all your requests. That’s why it makes sense to turn to us when you need a new kitchen or bathroom. Our Aqua Kitchen and Bath Design Center team members are highly skilled experts with extensive experience in the kitchen and bath business. We love what we do and we are great at our trade. When you trust us with your project, we will put all of our experience, expertise, and knowledge in getting the job done. If you choose a big box or general home improvement store, you won’t get that kind of quality service or expertise. Often, staff members are rotated from one store department to another and won’t have the same focused and expert knowledge in kitchen and bath as we do. We understand how important your kitchen or bath project is and genuinely care about it as much as you do. That’s why we make sure we ask all the right questions, understand your wishes and needs including the most vital part of your purchase – your budget! Big box home improvement stores won’t take a personal interest in your project or work with you as closely as we will. Kitchen or bath remodeling with us is a stress-free experience focused on delivering great products, service, and the results you are looking for. No other kitchen cabinet store or big box retailer in NJ can match our prices on stock cabinets. If you find any competitor who does, we will even offer to beat their cabinet price by 10% when you bring us a written estimate. Browse through our kitchen cabinets, granite countertops, and quartz countertops.